From Buddha to Tathagata, from Siddhartha to Sakyamuni, his search of salvation made him travelled through the many regions. Presently, these places have become repositories of Buddhism and are world popular Buddhist heritage sites. Visiting the trail that brings about solace in heart & mind is a sheer bliss in present day. The joy of traveling, along with mediation and knowledge that will alleviate your soul is an inner-treat non like other. 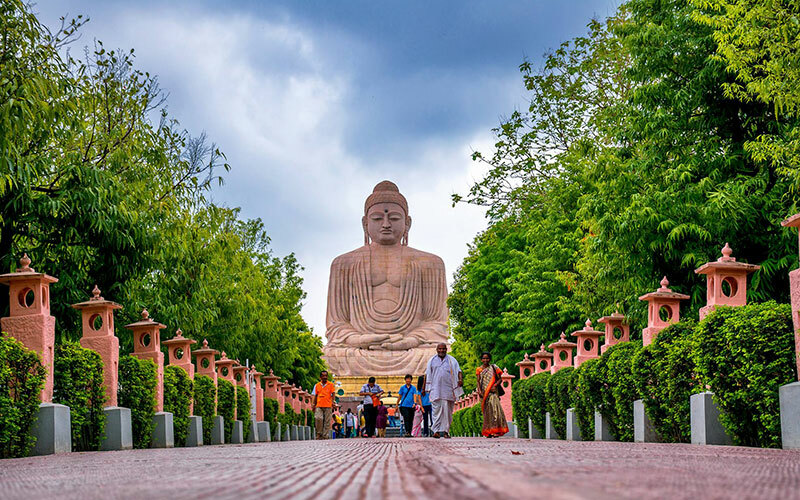 People from far& near, who have been keen to gain knowledge and understand Buddha in India have followed the trail from Lucknow (Sravasti) to Bodh Gaya and beyond. This trail, popularly termed as “Lotus Path”, has been walked by numerous in quest of Buddha. One of the most travelled Buddhist destinations, these places make the most of your vacation. With this splendid Search of Lord Buddha tour the followers are sure to go back with life changing memories to cherish forever. Max Holidays in order to assist you in your search for Buddha has planned a 10days tour. This tour will take you through different culture-rich regions of India where Lord Buddha searched for his path of truth, meditated and attained enlightenment. Experience the spiritual ecstasy through the Lotus Path, a blissful Buddhist circuit of India. 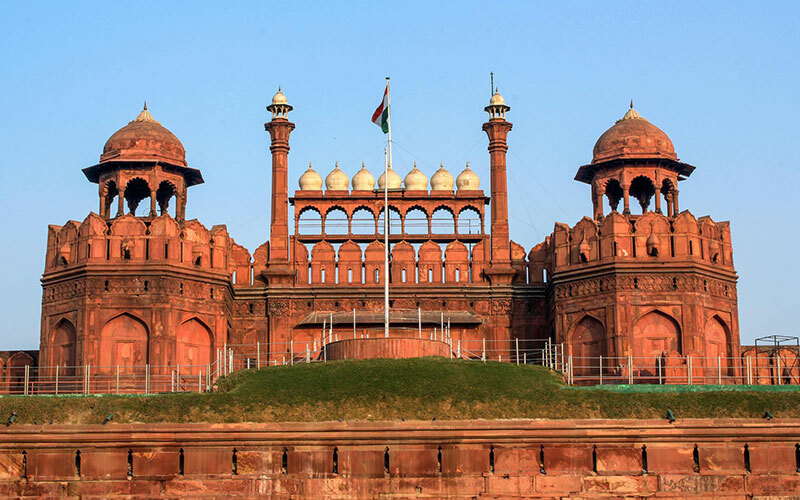 This 10 days journey is a serene journey through Delhi – Lucknow – Sravasti - Lumbini - Kushinagar - Vaishali - Patna - Rajgir - Nalanda - Bodhgaya - Gaya - Varanasi – Delhi, allowing travelers to explore the places where Buddhism flourished 2500 years ago and left its impression forever. Following the trial and searching for Buddha is a reason to rejoice. This 10 days journey allows tourists to visit the heritage sites that once witnessed the presence of Lord Buddha. On arrival at Delhi international airport, you will be welcomed by our representative who will make you feel comfortable and after such a warm welcome, the famous Indian slogan coming true to you, that is “Atithi Devo Bhava” (guests are God). He will assist you to your car and transfer to your hotel. Relax in the hotel for overnight stay. 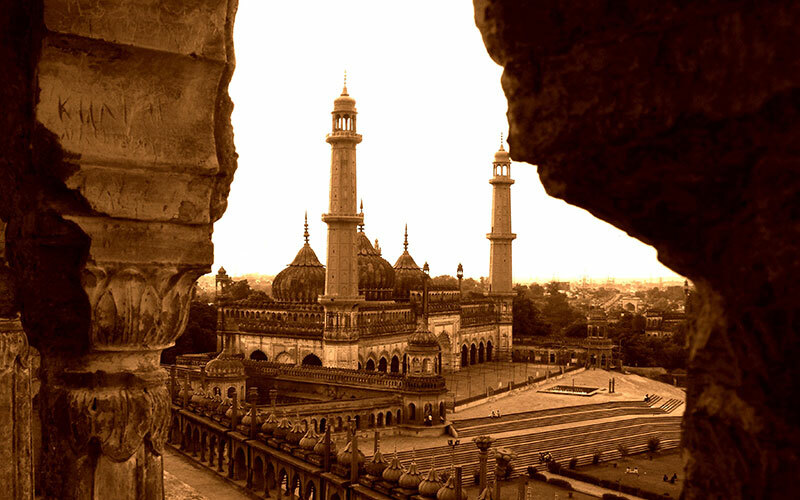 Early morning get assisted to the train station to board your train to Lucknow ‘the city of Nawabs’. Upon arrival at Lucknow train station, our representative will meet and assist you to your car, and drive to Sravasti which is 170 Kms. Sravasti is one of the six largest cities of ancient India. Buddha passed the greater part of his monastic life in this city. Jetavana monastery is a famous monastery in Sravasti. Overnight stay in Sravasti. Early morning, after breakfast, depart to Lumbini - the birth place of Lord Buddha. 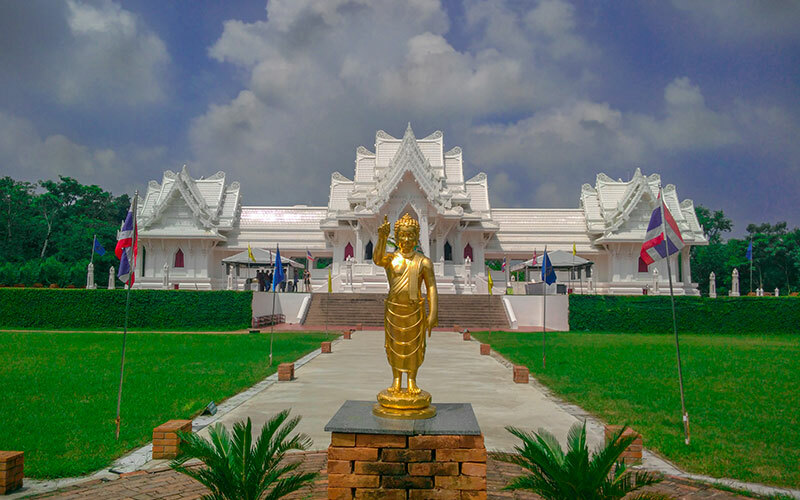 Lumbini, being one of the four holy places of Buddhism is the Mecca of every Buddhist. Check in hotel at Lumbini. Places worth seeing here are the scattered ruins dating back to the days of the Buddha. The remains of historic places, monasteries, temples and above all, a stone kept by India’s great king Ashoka to pinpoint the exact birth place of the Buddha are here to take you back to the ancient ages. Overnight stay is in Lumbini. After breakfast, we proceed for a sightseeing of Lumbini will include visit to Maya Devi Temple, Ashoka Pillar, and sacred Pond where Buddha’s mother took bath after giving birth and Lumbini Museum. Following sightseeing depart to Kushinagar. Check into your reserved hotel and overnight stay in Kushinagar. Early morning, we will departure for Rajgir, once the capital of Magadha Empire. Rajgir is an important Buddhist site as Buddha spent 12 year of his life at this place. The places of interest in Rajgir are Amaravana, Ajatsatru’s Fort, the Cyclopean Wall, Griddhakuta, Swarna Bhandar. Further you will have a drive towards Nalanda - one of the great universities and an important Buddhist center. In Nalanda you will be seeing Nalanda University archaeological complex, Nalanda archaeological museum, Nava Nalanda Mahavira and Hieun Tsang memorial hall. Evening back to Patna for an overnight stay. Early morning, we will depart to the oldest living city in the world - Varanasi popularly called Kashi or Banaras. Varanasi is rich in tradition and culture and holds a lot of historical and mythological significance amongst Hindus and Jains. The temples of Varanasi are said to date back to the 18th century and hence one will find millions of pilgrims thronging the banks of this religious city every year. Upon arrival, you will be escorted by a representative and check in the hotel already booked for you. Evening we will head towards the Dashashwamedh ghat, to enjoy the evening aarti at Varanasi. The ghats at the evening in Varanasi is most spectacular place to visit, here the young priests, chant the mantras to the holy river Ganga with the large flaming lamps. The whole area lit up with a beautiful golden glow from the lamps and with the aroma of sandal. Morning boat ride and sunrise (subah-e-banaras) will definitely going to amaze you in Varanasi. 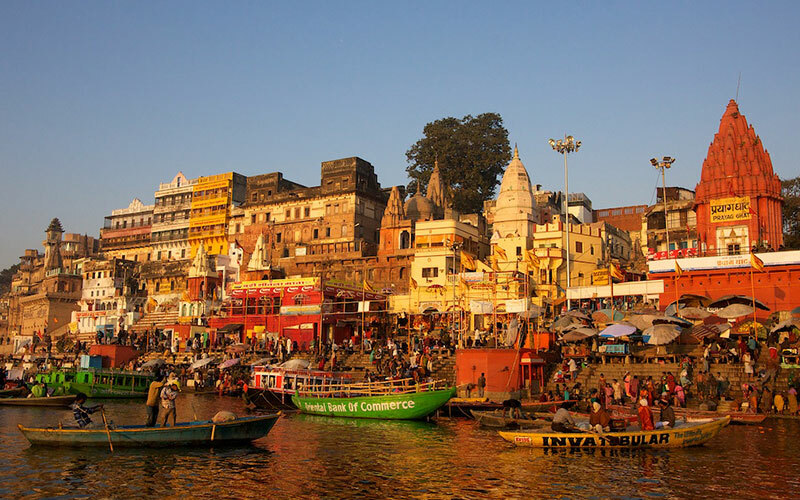 Ghats of Varanasi and some famous temples will be included in the sightseeing tour. Here in the morning you will see the people taking a holy dip in the river Ganga, to wash out their sins. You will also see the death ceremony taking place by the relatives of a body. Come back to hotel for breakfast, you will have excursion tour to Sarnath - a place where Buddha gave his first Sermon. In Sarnath you will be visiting Chaukhandi Stupa, Dhameka Stupa, Mulagandha Kuti Vihar and Sarnath Museum. Later return back to the city and visit the Durga mandir (also known as the monkey temple), Bharat Hindu University, where we will visit the Bharat Kala Bhavan which is an art museum housing paintings, sculptures of Buddhism and Hinduism, archaeology gallery etc. Evening, you will be transfer to railway station to board your overnight train to Delhi. Overnight aboard air conditioned sleeper accommodation. Meet and assist upon arrival at train station and transfer to the airport hotel for day use room. Later transfer to the airport to board your onward flight.